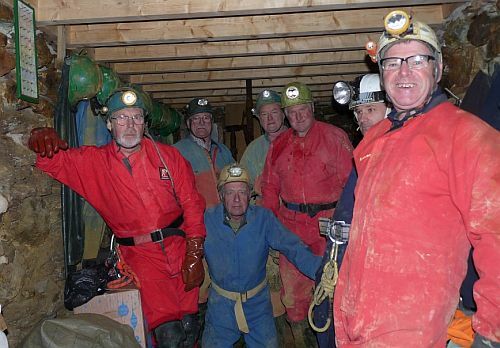 Parys underground group (PUG) was formed just over 20 years ago to explore and record the underground remains of copper mines at Parys Mountain, Anglesey. Copper has been recovered from this mine since the Bronze age, 3500 years ago. During the 18th and 19th century they formed the largest copper mine in the world. The underground workings were last mined in the early part of the 20th century. With the kind permission of The Marquis of Anglesey and Anglesey Mining PLC some areas of the mine have been reopened for exploration. It received its English name from a former land owner called Robert Parys who received the land as payment for service to the Crown in 1406. It’s original Welsh name of Mynydd Trysglwyn described it as being topped with a grove of trees covered in scabby lichens. The trees have now disappeared following the general deforestation of the land and in particular the industrialisation of the area in later centuries. The mountain has a history of copper mining going back 3500 years. However, it was in the 18th and 19th Centuries that the greatest amount of copper was produced. It is thought that in 150 years over 3.5 million tons of ore was raised, mostly by hand, from the Mona and Parys mine both located on the mountain. Today the scarred site is much quieter ,although one company Anglesey Mining PLC still retains the mining rights and are actively looking for polymetallic ores at the site. The underground group consists of people who have a common interest in trying to discover more about the history and underground workings of the Parys and Mona copper mines. Amongst its members are people who specialise in the history of the Amlwch area, professional geologists ,experienced cavers and those with no special skills but who can carry out some of the hard work required. As well as local members we have members from further afield who visit and assist us when they are staying in the area. The group meet at the mine every Wednesday evening. This is usually followed by a social get together in the Pilot Boat pub at Dulas on Anglesey from around 21:30. If you would like to join us either to become a member of just for a single trip you will be made most welcome. Please use our contact form for more information. Copyright Parys Underground group © All rights reserved.